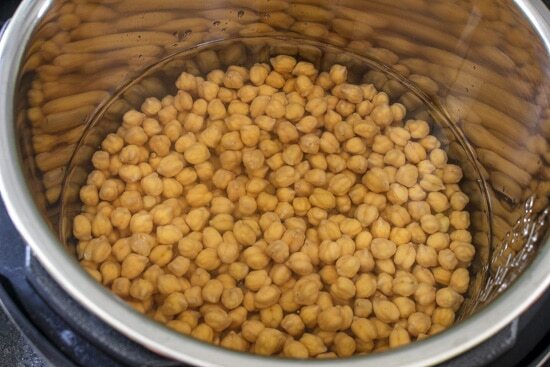 Here’s the handy guide on How to cook chickpeas in Instant Pot. Plus I am sharing many tips, how to store them and some of my favorite ways to use them. 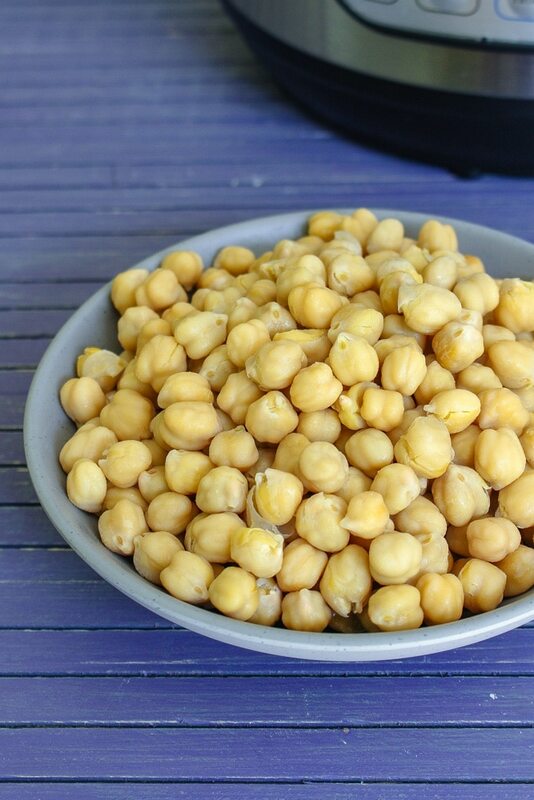 Does instant pot chickpeas taste same as canned chickpeas? Honestly, I have never tried canned chickpeas. Just because I do not like processed or canned food in my cooking. But I can definitely say that it will sure taste much better than canned chickpeas because they are freshly cooked without preservatives. 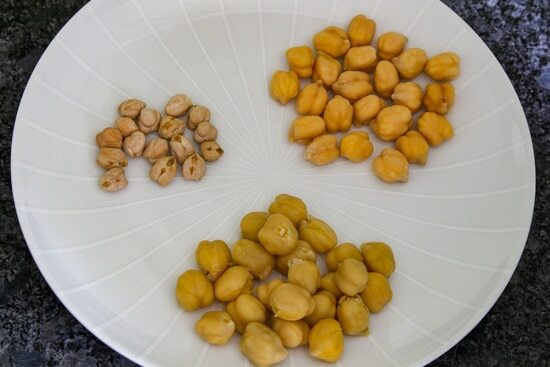 Take dried chickpeas in a colander and wash really well under running cold water till water runs clear. Soak in enough water (water should be 3 inches above the beans) for at least 8 hours or overnight. They will get almost triple in size after soaking. Discard the soaking water. 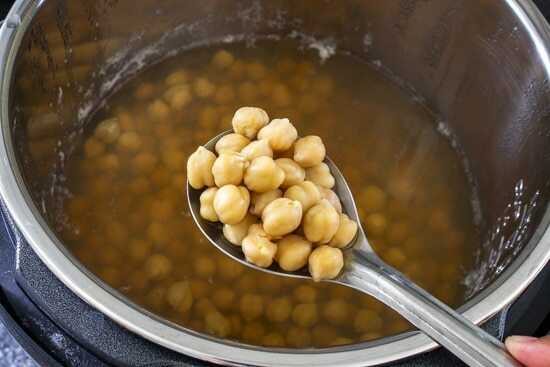 Take soaked chickpeas into the instant pot and add fresh water. Add baking soda. Cover the lid, keep the valve position to sealing. When you press the bean between thumb and finger, it should mash easily without any effort. Meaning chickpeas are cooked fully. 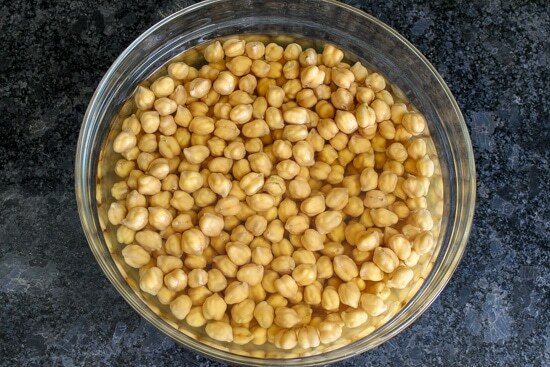 1 lb (~2 ½ cups) of dried chickpeas yield 2.4 lb (~7 cups) of cooked chickpeas. The cooking time may vary depending on the quality, type, and freshness of the beans. See the pic below (one is small in size compared to other). The smaller ones bought from the Indian grocery store (a product of India). It takes 10 minutes on manual (with overnight soaking) or 35 minutes (without soaking). The bigger ones bought from the American grocery store. It takes 15 minutes on manual (with overnight soaking) or 45 minutes (without soaking). The older dried beans meaning those stored more than a year will lose its moisture and take longer to cook. 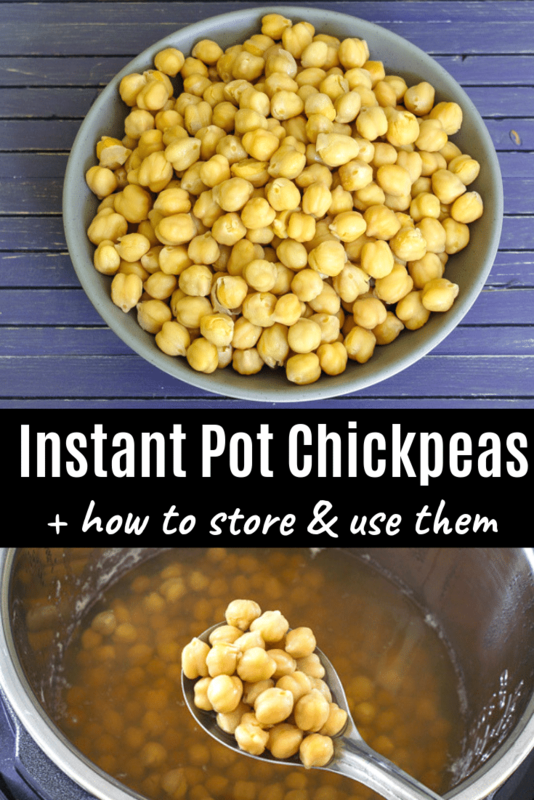 How to store instant pot chickpeas? 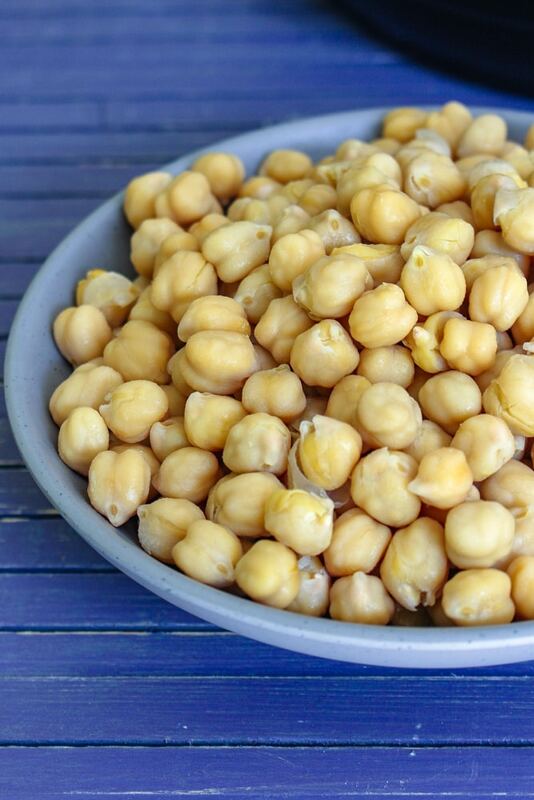 Refrigerate: Keep the cooked, drained chickpeas in an airtight container and store for 3-4 days only. 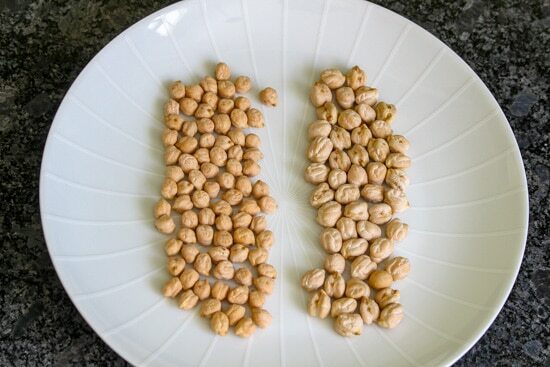 Freeze: Drain the cooked chickpeas completely and let it dry for some time or pat dry using a paper towel. Spread in single layer on a baking sheet and keep in freezer till frozen. It takes around 45 minutes. Then transfer to a freezer-safe container or ziplock bags and store up to 3 months. Recipes using instant pot chickpeas? Do I need to soak chickpeas before cooking? The answer is yes and/or no. I always prefer to plan ahead of time and let it soak overnight. This is how I have seen my mom doing it since my childhood and I am following the same. There must be some reason that our elders were always followed the soak method. Pre-soaking the chickpeas will reduce the cooking time. This reduced cooking time can mean less loss of water-soluble nutrients due to less time of exposure to heat and water. This is the reason, I prefer overnight soaking. Baking soda helps chickpeas to cook and soften through the middle. And it keeps the beans moist from inside. If cooked without baking soda, beans will be soft but dry from the middle. If the salt added in the water, the beans will cook till soft but the skin will stay tough. So always season the chickpeas once they are cooked. 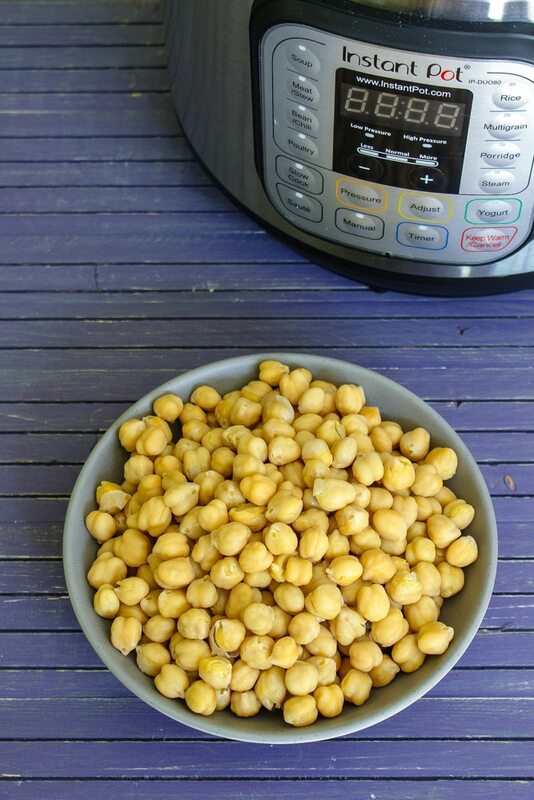 The handy guide on How to cook chickpeas in Instant Pot. These instant pot chickpeas taste better than canned one. 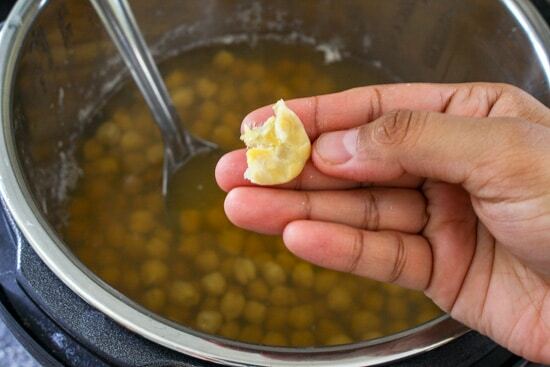 Wash the chickpeas well under running cold water. Soak in 6 cups of water for 8 hours or overnight. 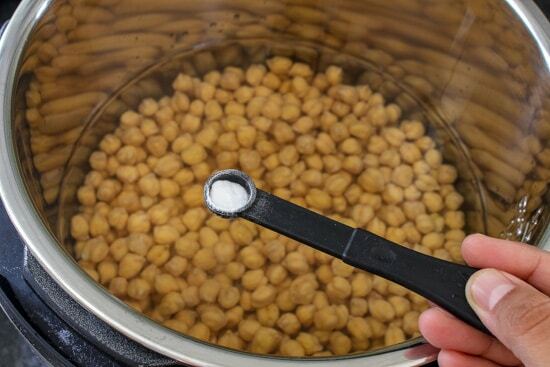 Add soaked chickpeas, 8 cups water, and baking soda in the instant pot liner. Cover with the lid, keep the valve to sealing and cook on manual (high pressure) for 15 minutes. Let the pressure release naturally, once pin drops open the lid. Drain the cooking water and you have cooked chickpeas ready.